The dominant narrative to emerge from the Hunger Games: Mockingjay Part 1 press tour is that Jennifer Lawrence really, really hates singing. Lawrence was apparently scarred by a childhood experience in which her supportive Southern mother encouraged her to sing in front of her entire school, a performance she claims was a total embarrassment although it was probably the charming kind that only made her classmates love her more, because she’s Jennifer Lawrence. So when she learned Katniss performs a song called “The Hanging Tree” in the film, Lawrence apparently broke down in tears. But now the joke’s on J-Law as “The Hanging Tree” debuts at number 12 on the Billboard Hot 100 chart. Lawrence has apparently yet to listen to the song, but she has recounted the “traumatic” story of singing it for just about every press outlet. “The Hanging Tree” was written by The Lumineers’ Jeremiah Fraites and Wesley Schultz, with lyrics by Hunger Games author Suzanne Collins. 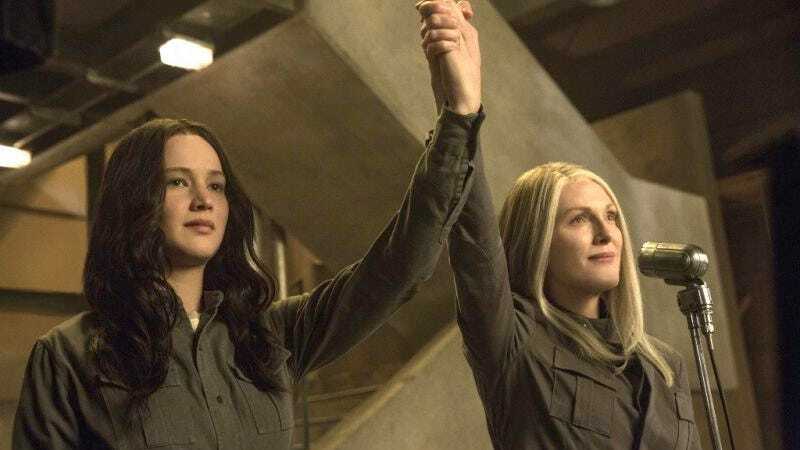 The District 12 lullaby, which becomes a rallying cry for rebellion in the Districts, scores one of the more moving sequences in the film. “The Hanging Tree” beat out Meghan Trainor’s “Lips Are Moving,” the Jessie J/Ariana Grande/Nicki Minaj collaboration “Bang Bang,” and Beyonce’s “7/11” for the number 12 spot. The song even bested the film’s official pop single, Lorde’s “Yellow Flicker Beat,” which currently sits at number 34.